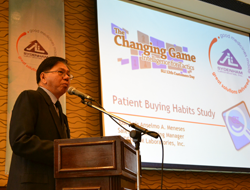 SLI recently held its 14th Customer's Day at The Bellevue Manila last April 28, 2015. The event highlighted its theme: Conquering Barriers, Making Strategy Work where invited keynote speaker, Mr. Rey Gerardo Bacarro gave his insights on the topic: Current Strategic Considerations in Achieving Profitable Growth. Mr. Jacob Pena, SLI Vice Chairman and CEO talked about The Neglected Business Management Process. The SLI Customer's Day is an annual event where the company gives appreciation to its clients by imparting knowledge and industry insights that will help them grow their business. 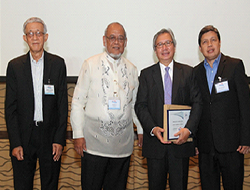 In Photo (L-R) Mr. Abe Vilacorta - SLI Consultant, Mr. Jacob Pena-SLI Vice Charman & CEO, Mr. Gerry Bacarro-Former Pfizer Regional President for Asia and Mr. Robert Bautista -SLI General Manager and COO. SLI celebrated its 13th Customers Day last May 15, 2015 at the Bellevue Manila with it theme: Changing Game 2: DO GOOD, DO WELL. The event is hosted by Mr. Jun De Jesus and Mr. Chito Meneses. The program commenced with the opening remarks of Mr. Abelardo F. Villacorta and the presentation of Customer Satisfaction Survey Results, presented by SLI General Manager, Mr. Roberto V. Bautista. The event also culminated the launch of a Collective Social Responsibility Movement, dubbed as ShareLife-which SLI customers can be an advocate in helping the indigent Filipinos who have limited ability to purchase medicines. The launch was initiated by SLI President, Mr. Michael dela Cruz by discussing advantages in building a collective social brand to do good. Mr. Jacob A. Pena, SLI Vice Chairman, led the forum together with Dr. Anthony Leachon, President of Philippine College of Physicians, Ms. Nancy Tacandong, Executive Director of Philippine Chamber of the Pharmaceutical Industry, Alexander A. Padilla, President and Chief Executive Officer of PhilHealth and Dr. Ned Roberto, a known marketing guru. The reactors gave their insights on how this movement will be successful and answered prevailing issues about the healthcare system in the Philippines. SLI Customers Day is an annual event organized to thank SLI's valued customers and other stakeholders that contributed to its ongoing success. SLI Sales and Marketing has recently taken part in the Annual Gathering of Lupus Foundation of the Philippines through the medicines donated for the lupus patients. The Lupus Foundation of the Philippines is a patient organization designed to provide information, moral and emotional support among lupus patients and their caregivers. Lupus is an autoimmune disease where the body's immune system becomes hyperactive and attacks normal, healthy tissue. This results in symptoms such as inflammation, swelling, and damage to joints, skin, kidneys, blood, the heart, and lungs. Unravelling the travails of the disease, lupus patients can now manage to live on despite the adversity through the help of different companies, organizations and socio-civic groups.